Awwww!!! I was going through some of my old photos, look how sweet! I remember this one and thinking it wasn't that good.. crazy! We are way to judgmental when it comes to our own work. I look at this now and wonder if I could make one as sweet again, lol See how a little time and experience can change the way we think! All I see now is the cutest, sweetest little guy I ever made! And I adore him. stomach was turning and I thought it should be cuter or better in some way, WoW!! Such crazy thoughts.. I look now and wonder how I did it! Sewing thread?? And it's jointed? Really?!! He isn't the cutest, I'll admit that still, lol but goodness me, I was being waaayyy too hard on myself no doubt about it! To just make a magic ring with 6st with sewing thread is something to be proud of! And then to get all the parts together was a huge challenge! Not that good?? I say, what were you thinking Sharon Ojala!! I think in 2015 I'll do another photo shoot with these two. They will probably end up living in one of my dollhouses, right now they are safely tucked away in a jewelry box. PS: I made the brown one with punch embroidery thread. I then made another which is my miniature Panda so I could have a published pattern for him. I ended up making the panda bigger, about a half inch taller or so, but making him bigger was easier to explain how to shape and sew it together. To make the brown one you'd just have to change the position of the ears and the way you shape the muzzle and of course use one solid color. Have a wonderful, and crafty day! How true. Thank you for being so honest and sharing these thoughts Sharon as your work is so lovely. Se pone tanta energía y cariño en hacer estos pequeños que es imposible que salgan mal. Thank you for your post and encouragement. I have been working on knitted mittens for my dd and struggling with them. I rarely knit preferring crochet which means I'm not as accomplished with knitting. I was feeling discouraged with how the first mitten turned out but after reading your post I realized I'm being WAAAY too hard on myself. It looks pretty nice all in all and it will keep her hand warm... hopefully I'll do better on mitten number 2 but even if I don't they're still be very nice! And your little bears are adorable! I cannot imagine crocheting with sewing thread!! awww, I couldn't ask for a better comment! I'm so happy that you feel that way and you can see that the mitten is fine and your dd will be very happy with the mittens and the thought! Thank you for the kind words as well, I appreciate that. I enjoyed your article above about being hard on ones self. I can't even imagine crocheting with thread. They are magnificent. I have a question for you. 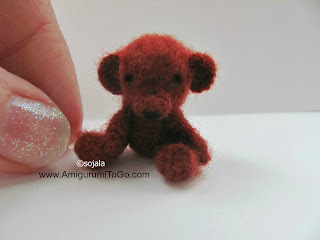 I am making the Little Bigfoot Bear. I really messed up this one. I did a terrible job of sewing the head to the body. I realize now what I did wrong and so I'm going to make another one. My other problem is that the legs are much too big and I don't have room on the body to fit them in. My row and stitch count were right on. The only thing I can think of is that I should have put more stuffing in the body. Although it looks ok. Anyhow I'm going to do it over again. I watched your video on sewing the legs on and found it so helpful. I'm going to have to get some shorter pins. The ones I have are too long and don't hold the leg in place well enough. Hi Dorothy, that's one of my older patterns from 2012.. I don't have a video on that one but I am just about ready to start filming those. I want to do the whole set so the bear, hippo, monkey, bunny.. and so on. Those ones have exactly the same heads bodies and limbs so the filming shouldn't take me too long and most of the animals in that series will be in one video. So many people liked those small ones so I should get to it, lol I was thinking at first I'd retire those patterns but now I think that would be crazy! I was new at designing when I made them and I was being hard on myself for them not being perfect but now I know better :) Thanks for asking! Ohh, I love those teenies! I have loved miniatures my entire life, and making them is even more fun than collecting them. 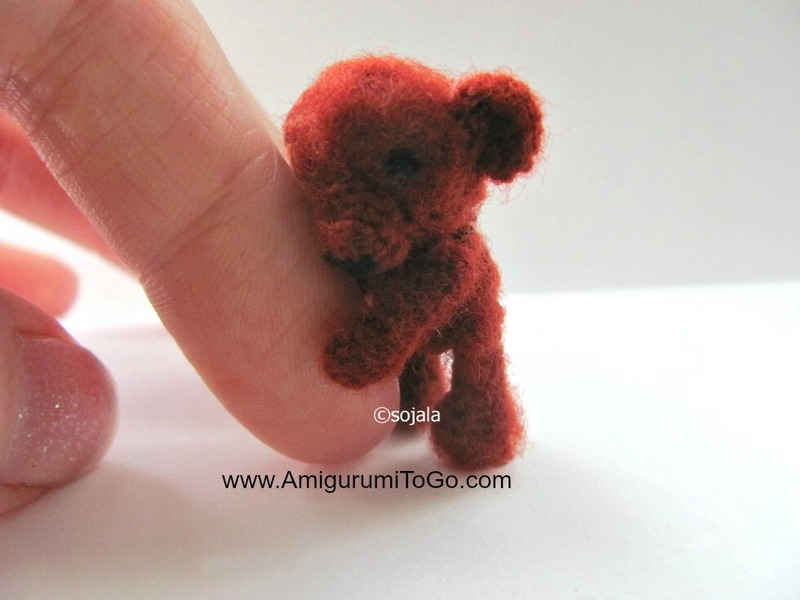 The first thing amigurumi I had ever seen were the micros by Suami on Etsy. I thought I should figure out the basics in full-size before tackling the mini projects. 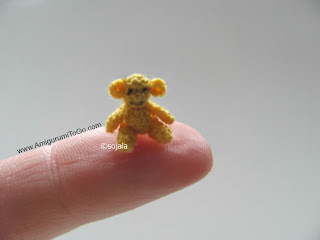 The first amigurumi I ever crocheted was one of your designs. When I noticed your minis, I am now convinced I can do it too. 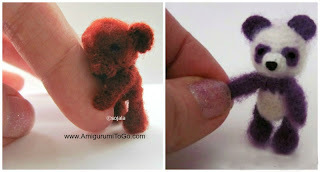 Just one question, where did you get a hook tiny enough to crochet sewing thread? The smallest one I have is 1.25mm but still too large for sewing thread, I think. yes, look at the bottom of the post under the PS, the link to the pattern is there. Thank you for your patterns but also for showing beauty in our flaws. No one is perfect neither do we make perfection. In a way as a disabled person this is an analogy that its ok to have imperfections. Gosh i didn't explain that well! Thank you.